The toddler Hinda Cohen was deported to Auschwitz in a children’s aktion (action, or round-up) that occurred in the Kovno Ghetto, on March 27, 1944. Hinda was murdered in Auschwitz. 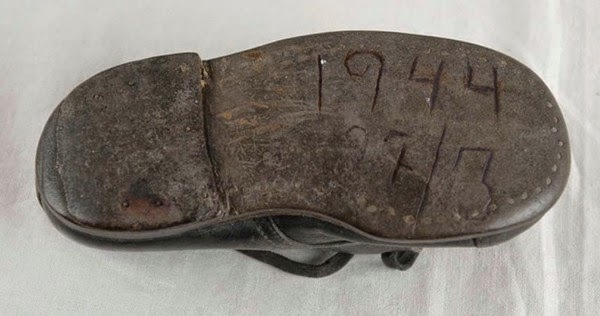 When Hinda was taken from her bed to be deported to Auschwitz, her shoe was left behind. Upon finding it, her father etched the date on the shoe’s sole. Her parents, Dov and Zipora Cohen, survived the war. They kept their daughter’s shoe, the pair of mittens that Zipora had sewn for her from scraps of material, and her birth certificate, until they died.